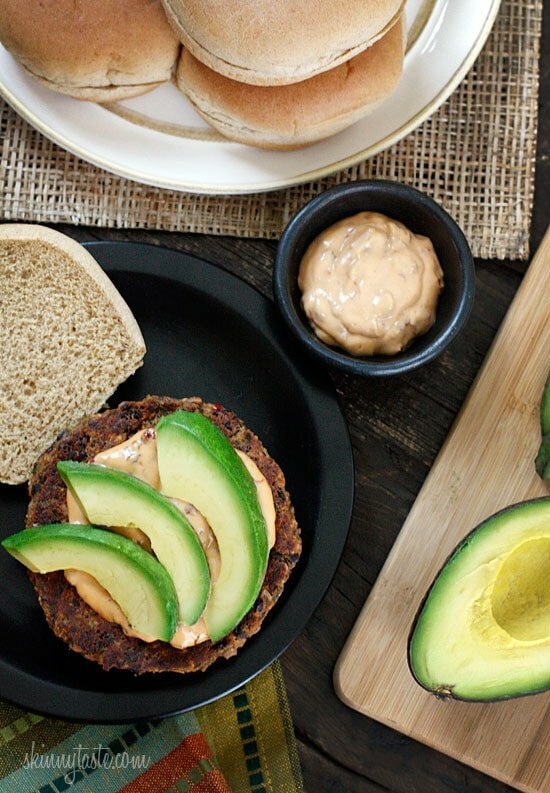 One bite of this spicy black bean burger with spicy chipotle mayo and creamy avocado and you won’t miss the meat! Yes, these were good enough to please even the adult carnivore’s in my home (a bit too spicy for my kids). Make no mistake, I love meat, but I also think it’s good to give it up at least once a week, so why give Meatless Mondays a shot? Pretty inexpensive to make and really not hard to make. The hardest part is forming them into patties, and even that isn’t so bad. These cook best if frozen so plan to make them ahead and cook as needed. You can even double the batch to keep them on hand whenever you need them. To store them in your freezer, freeze them on wax paper until they set, about 2 hours, then transfer them into containers. 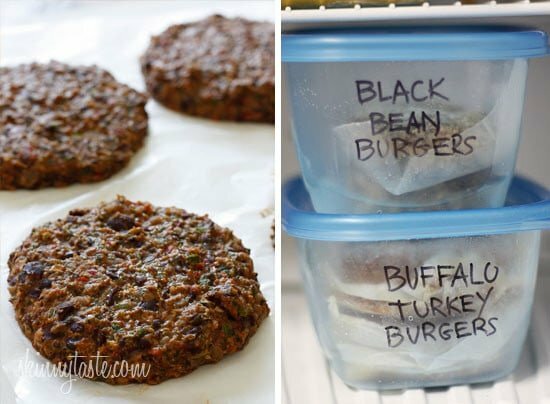 I keep all my homemade burgers labeled in Glad Freezerware containers which can withstand extreme temperatures without cracking. Labeling them keeps them organized so when I have backyard BBQs, I have something to please every palate. Also perfect for once a month cooking! Vegetarian, High in Fiber, and Gluten Free if using GF oats (excluding the bun). I highly recommend making them exactly as written, don’t change a thing! Dry the beans well after washing, extra moisture will keep the burgers from sticking. In a medium bowl, mash beans with a fork until thick and pasty. In a food processor, finely chop bell pepper, cilantro, onion, and garlic, then add oats, then eggs and spices. Then stir into mashed beans. *Nutritional value will vary slightly depending on buns. Look for low calorie whole wheat buns. For gluten free buns look for Udi’s or Three Baker’s brand. Points will increase. As part of the Foodbuzz Tastemaker Program, I received Glad FreezerWare Containers to review. All opinions are my own. 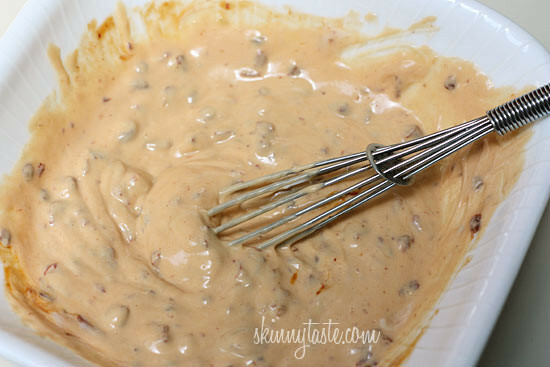 When adding adobo sauce to the mayonnaise, do you add the chili pepper or just the sauce from the can? Can’t wait to try these ???????????? Any idea what the nutritional information is WITHOUT the bun? Can these go directly on the grill after freezing? Or will they fall apart? This was amazing!!!! Thank you 🙂 Your recipes are always fabulous! My kids have an allergy to eggs. Would an egg substitute work? Made these last night. Holy cow amazing! 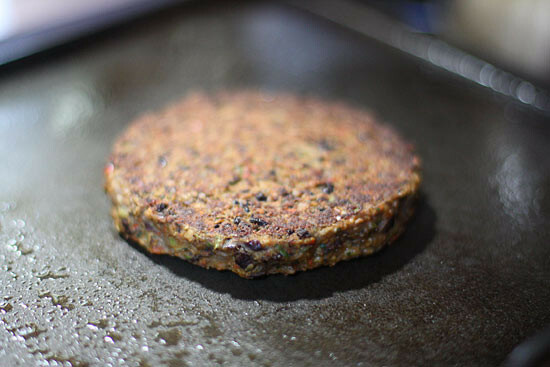 I love black bean burgers but havebeen unable to eat my favorite ones from Costco as they contain soy. Definitely cook them frozen and they do firm up once they are fully cooked. I made them on the grill as suggested on lightly oiled aluminum foil but next timewill try on a cast iron pan. I made these yesterday, fried one up today, and was very pleased ! Followed the recipe exactly, but added two extra tablespoons of oats. I didn’t have waxed paper, so I used parchment sprayed with a little vegetable oil. Forming patties wasn’t really an option, I just sort of plopped them into four circle shapes and put them in the freezer. Once frozen, however, they stayed together well in the frying pan. I didn’t make the chipotle mayo, but will try that another day. I topped the burger with my homemade tzatziki sauce., some iceberg lettuce, cheese, and a pickle. DELISH! I’ll be making these again! How many freestyle points is this recipe? 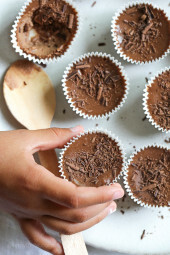 All recipes have been updated to reflect the free style program. How can I reduce the sodium in this recipe? 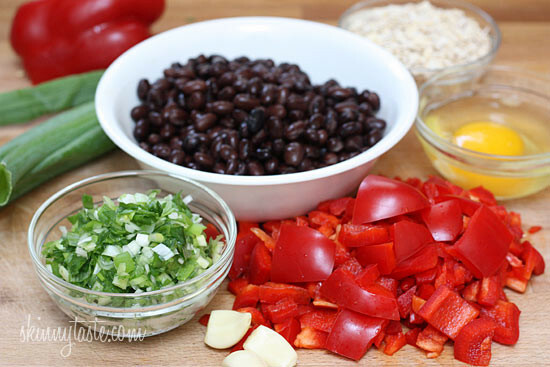 You can use “no salt added” or “low sodium” beans. Very good flavor on these but the texture turned out a little soft for me. I used a large egg, instead of jumbo bc that’s what I had. Maybe I’ll add a little more oat, or some bread crumbs next time. My recipe builder also showed 1 point on freestyle smart points for the burger itself. 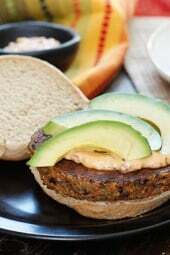 Been looking for a tasty black bean burger, thank you so much! Just made these again, because I love them so much… I double checked the points and i think with the new freestyle program the patty only is 1 point now. How long in the oven ???? And do they have to be frozen if I am going to bake them ??? Gina – I love all your recipes. Your cookbooks and your website are my go to. One question – do you cook the oats first, or put them in raw?? 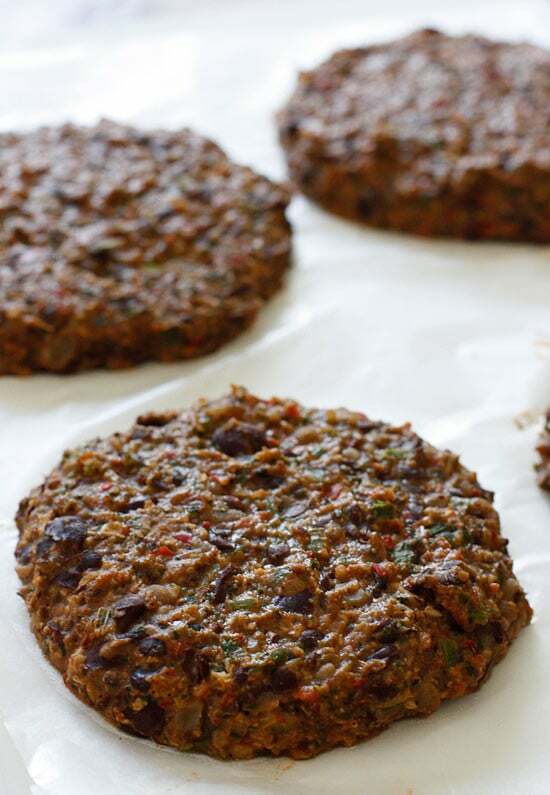 These black bean burgers are not only easy to make but ABSOLUTELY delicious!!!!!!! 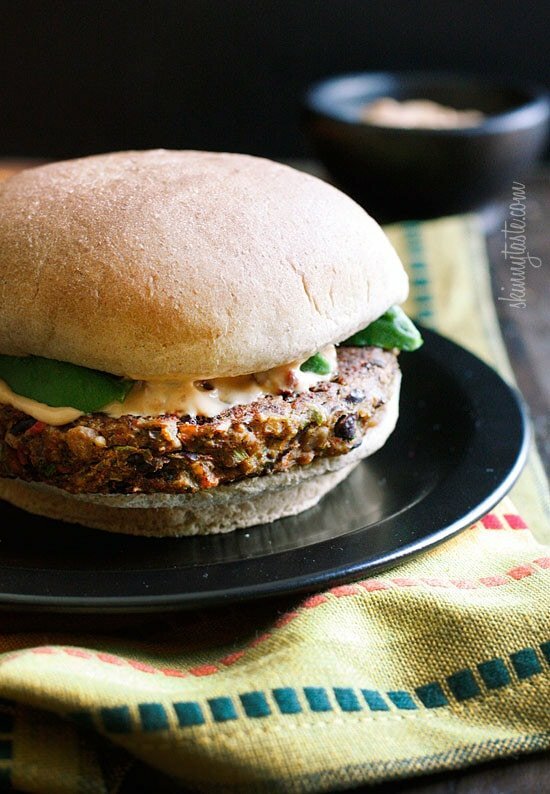 Easily the BEST bean/veggie burger I’ve ever had anywhere – even in a restaurant – still so shocked I made them myself & they were THAT good! My husband and I legit YUMMMmmED through the whole meal!! I doubled the recipe so I could freeze some patties for a quick go to meal & I’m so happy I did because these are KILLER! I chopped all the veggies because I didnt have a food processor on hand & I added some additional spice (cumin, smoked paprika, Black pepper, adobo) also used fresh flat leaf parsley instead of cilantro because I’m just not a cilantro fan. Big fan of these! Will definitely make them again! And already send the recipe out to friends and family! HIGHLY Recommend! Hi!! I love these burgers. Can you update the freestyle points? Thank you! All freestyle points are updated. I was wondering the same thing. I also calculated it as 1 SP per patty under new freestyle program. I calculated 1 point as well for just the patty. The oats are the only thing with points. Will old fashioned oats work or do they have to be quick cook? These were so delicious! I’m curious, how long do you think they’ll last in the freezer? Would love to make a big batch and cook when necessary! Thanks! Was it frozen when you cooked it? Could the scallions and cilantro be left out or replaced with different herbs? Don’t like the taste of either. Can you cook these and then freeze them to be heated up quickly in the microwave? 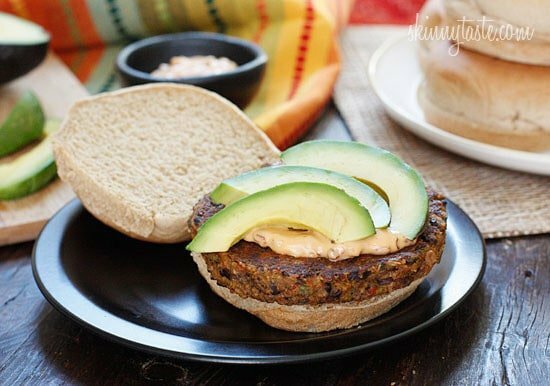 How many calories just per patty please, without the bun and dressing? Sorry I don’t have that information handy. Is there anything I can sub the oats with? 50g of carbs is really a lot…does this include the buns? If so, how many carbs without the buns? Yes it does include the bun, sorry I don’t have the nutritional info without it. CAN I MAKE IT WITH OUT EGGS ? Not sure if they will hold together? I make them using the Flax and water mix for the egg. They hold together nicely. You could use a little sweet potato instead of egg. First let me say – I absolutely love your recipes, and recommend Skinnytaste to EVERYONE I discuss recipes with (even my nutritionist)! Question: Do you think quinoa instead of oatmeal would work? Do you put oats through food processor? Was unsure on this point, Thanks! 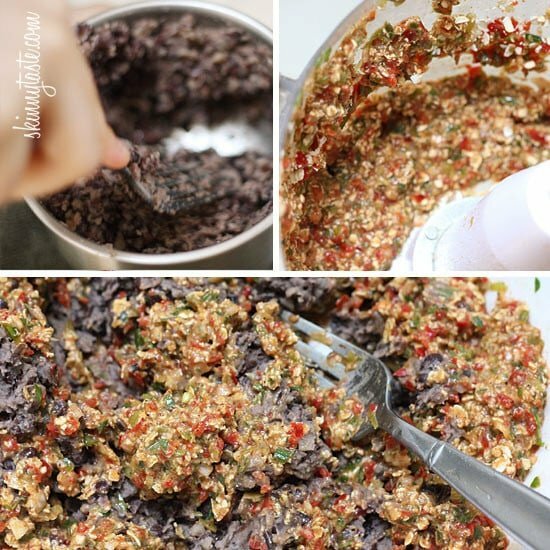 Super love this recipe! Just made a new batch! Do you know the calorie count for just the party itself? *patty not party 😉 Well, it is a party with these babies! LOVE the adobo flavor in the mayo!! Has anyone tried putting adobo in the burger patty instead of hot sauce? Love, love, love! Added some leftover green onion and cilantro to the mayo for extra herb goodness and to help use it all up, great decision! Also made these in the same week that I made the sweet potato sloppy joes, great way to use up the whole bell pepper! Excellent recipe. I was using a different black bean recipe prior to this that always fell apart (even when frozen prior to cooking). Absolutely love this recipe and it will now be replacing my old one! Thank you!! 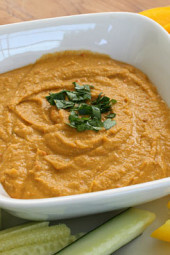 Try a “flax egg” 1 Tablespoon of flax meal mixed in 2.5 Tablespoons of water and let sit for five minutes. I made these this week, and they were FANTASTIC! Thank you so much for the great recipe! Bought a food processor just for this recipe and guess what? WORTH IT!!! They’re in the freezer right now for a rainy day but they were definitely tasty in the creation process. I haven’t tried these yet. I’m just commenting to say that in general your website is awesome!! I love that you always add such helpful tips and along with the recipes. It’s a little more encouraging to try new, healthy things if I got the recipe from your site. I’ve tried many recipes and it’s rare that I don’t like them. (And I’m a picky eater so that’s saying a lot!) Thanks again and keep up the good work . Loved this recipe. Subbed tomato for red pepper as I didn’t have any on hand & it tasted great. Burgers held their shape well, cooked easily, tasted great. Next time I will add more Sriracha for more heat. My picky meat-eater boyfriend loved these as well, big hit! Love – Love – Love these !!! They are on the weekly rotation. I always double the recipe and send half over to my parents. Q: Mine do not hold shape when they cook – I just put them on the bun – more like a sloppy joe… any suggestions? Hmm, are they frozen when you cook them? Can you tell me about how many smart pts the Chipotle mayo is? 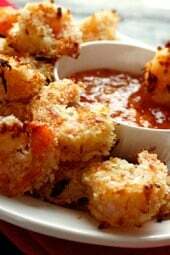 One of my favorite recipes- these are so flavorful and easy to make!